At Pittsford Dental Excellence Center, we can start your child down the road to a lifetime of good oral health. The cornerstone of our pediatric program is a comprehensive regimen of preventive care—a combination of treatments and procedures geared to stop any potential problems before they start. When should your child start seeing the dentist? We follow the American Academy of Pediatric Dentistry’s recommendation in that your child should begin visiting the dentist by age one, or within six months from the time their first baby tooth erupts—whichever comes first. Once your child enters a dentist’s care, visits at least once every six months are recommended. What can your family expect when visiting our office? At each of these visits, the dentist will perform a thorough examination of your child’s mouth and teeth to look for signs of decay and ensure the proper emergence of the baby or permanent teeth. 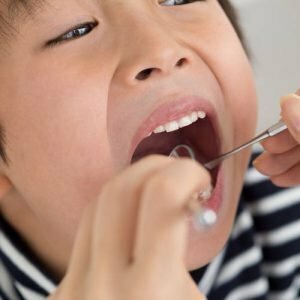 At Pittsford Dental Excellence Center, one of our professional and compassionate dental hygienists will clean and polish your child’s teeth, also providing instruction on proper flossing technique. We welcome questions or concerns that you, or your child, may have about their dental hygiene and oral health. We also recommend routine dental X-rays. These allow us to find early signs of decay while also making sure your child’s teeth and mouth are growing properly. Sealants – a permanent coating that is applied to the chewing surface of the teeth to protect against decay and the accumulation of plaque. Ideal for molars and bicuspids, usually the biggest trouble areas for children to clean properly by themselves. Fluoride – This naturally occurring mineral has been scientifically proven to protect against tooth decay and harden small imperfections on the surfaces of teeth. In addition to recommending the use of fluoridated toothpaste and mouthwash, we also offer in-office fluoride treatments, as well as a home fluoride tray, which is available for children with a significantly high risk of developing cavities. Pittsford Dental Excellence Center is here to provide the dental care your child deserves. Contact our Pittsford, NY office today at (585) 248-2575 to schedule a consultation.